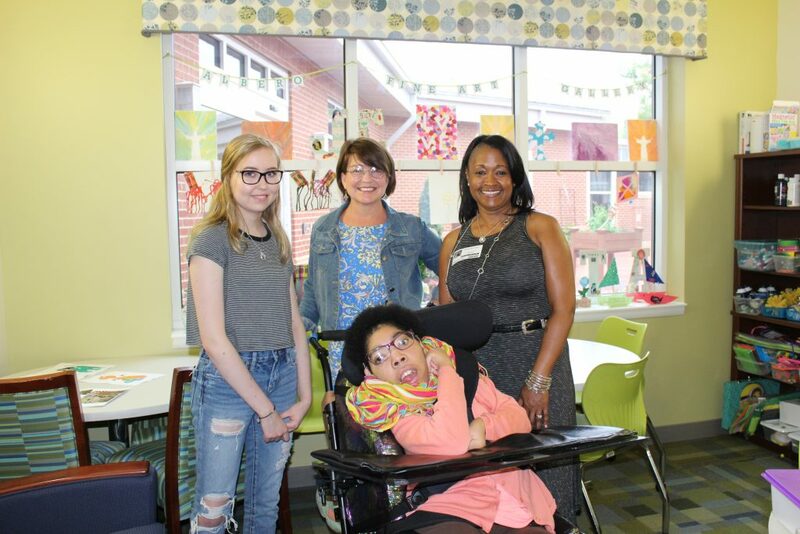 Mercedez, seated, who lives at The Albero House for adults at St. Mary’s Home, greeted Terrie Mitchell, owner of Bella Tu Boutique, right, when Mitchell presented St. Mary’s with a donation for more than $600 from a special consignment event. Also on hand were, from left, Jenna Crumley, a founder of the Kid2Kid youth volunteer group at St. Mary’s Home, and Kathleen Kaurup, St. Mary’s director of philanthropy. NORFOLK, Va. (Aug. 1, 2018)— Bella Tu Boutique donated more than $600 to St. Mary’s Home for children and adults with disabilities after what started as a one-day fashion fundraiser turned into a multi-month consignment event. Terrie Mitchell, owner of the upscale Virginia Beach consignment shop, had invited the St. Mary’s Kid2Kid youth volunteer program to collect clothes for a special sales rack to benefit the Home. Mercedez, who lives at The Albero House for adults on St. Mary’s campus, was on hand to greet Mitchell when she visited St. Mary’s to deliver the donation. About St. Mary’s Home: St. Mary’s Home in Norfolk provides around-the-clock care for 88 Virginia children and 12 adults with disabilities. For more information, visit www.SaintMarysHome.org. Download a PDF of this release. This entry was posted in news by marcomm. Bookmark the permalink.